Daniel Bell passed away in 2011. As noted in the past: "Daniel Bell has had a lasting impact on my thought, and I can say I agree with 99% of his writings" (1). 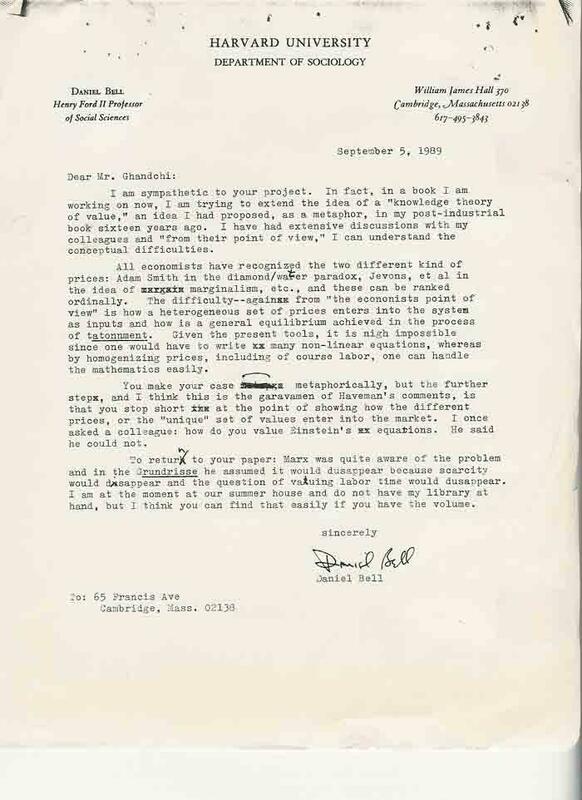 In Fall 1985, when I published the paper "Intelligent Tools: The Cornerstone of a New Civilization" in AI Journal, I received a letter from Daniel Bell, who wrote to me that he found my anthropological material of interest, but did not agree to the usage of the term "intelligence" and preferred the term "inference" (2). In 1989, when discussing "uniqueness value" in economics, Daniel Bell in a letter to me (3), sent his astute observations which were noted in the preface (4). Daniel Bell was a futurist whom despite working on fundamental issues, was also aware of current affairs. For example, he wrote a very accurate analysis of post-modernism which is the root of cultural relativism, in his 1996 Foreword to his book entitled "Cultural Contradictions of Capitalism" (5). Also at the time of US Invasion of Iraq, despite his old age, wrote very attentively about the event (6). After the discussions of Artificial Intelligence and Theory of Uniqueness Value, in an article entitled "Social Justice and Computer Revolution" (7), my focus was on social justice in the post-industrial economies. In 1989, I returned to my work of six years before that time, entitled "Progressiveness in the Present Epoch" (8), which I had published in Iran Times of Washington DC, and in two writings entitled "Dancing in the Air" (9) and "Meaning of Life" (10), discussed new philosophical views and basically discussed a new look at the world. Iran's 1979 Revolution had proved to me that the solutions of the Left and Right do not work anymore, and therefore new solutions were of interest to me. The year 1989 was the last year I worked at Nova Bookstore in Sunnyvale of California. Again contacted Daniel Bell and discussed all my experiences with him and asked him where these fundamental topics can be discussed, and he sympathized with me and wrote "Years ago, there was a tradition of independent scholarship, and independent journals where such work could be published. Unfortunately, most of our disciplines, including my own, have become 'professionalized' and much of the work impenetrable." Later when I worked in new technology companies, we continued our contact and he was interested to know about the progress in firms that founded the Internet. But the reality was that the futurists of Daniel Bell's era fell behind the advancements of the 1990's although they were the prophets of the Information Society in the 1970's. Those who were the new generation of futurists basically rose from the world of technology itself, and two prominent examples were Marvin Minsky (11) and Ray Kurzweil (12). In reality, with Kurzweil, the paradigm of futurism was redefined and the subject of Post-Industrial Society was replaced with Singularity (13). 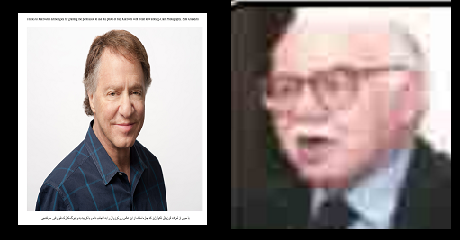 In a new book that was published by this author entitled "New Variant to Meet Human Needs," I benefited from generous help of Ray Kurzweil which is acknowledged in the introduction and throughout the book (14). Kurzweil in a note yesterday said that he will continue his discussions of "Singularity is Near" in a new book expected in 2019 entitled "Singularity is Nearer". The basic questions that are the center of attention for Ray Kurzweil in his next book were discussed today in a video with Peter Diamandis which is definitely worthwhile to carefully listen to (15). At the end I should note that unfortunately Iranian political community is too much involved in discussions of Islamism and Marxism and has fallen behind these intellectual topics of 21st Century although the Iranian Futurists are very closely following all these advancements. 3. Daniel Bell's Letter to me about "A Theory of Uniqueness Value"
نامه دانیل بل درباره "یک تئوری ارزش ویژه"